There has been plenty of football around Europe, with plenty of games and goals in the Premier League and Champions League. There were quite a few interesting boots in and among and we celebrate this with another round of boot spots. We can't complain about a lack of football anymore. This weekend saw the kick off of the Premier League and yesterday the Champions League got up and running too. Big European fixtures give the players plenty of chance to express themselves with great goals, but it also gives us a chance to check out their new boots, which we do here. 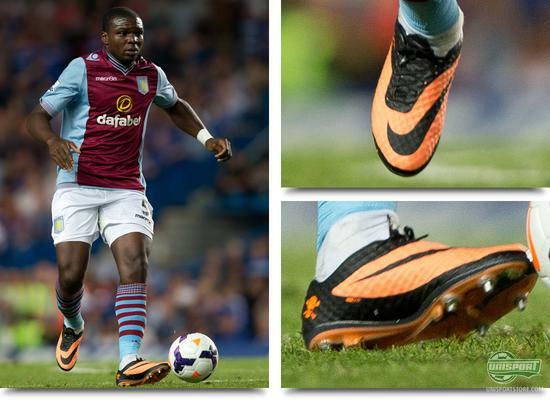 Jores Okore (Aston Villa)  Nike Hypervenom Phantom Bright Citrus/Black We start of in the English Premier League, when Aston Villa faced a tough challenge at The Bridge. They faced Mourinho's Chelsea and made quite an account of themselves. The thrilling encounter ended in bitter defeat for the Okore and the rest of the Villians, after a series of absurd refereeing verdicts led to their demise. Okore made a good showing on his debut for the club, while wearing the new Nike Hypervenom Phantom, which is an unusual choice for a centreback. Alexis Sanchez (FC Barcelona)  Nike Mercurial Vapor IX Volt/Black-Bright Citrus & Neptune Blue/Volt-Tide Pool Blue Which colourway Alexis Sanchez prefers looks to be hard to tell. 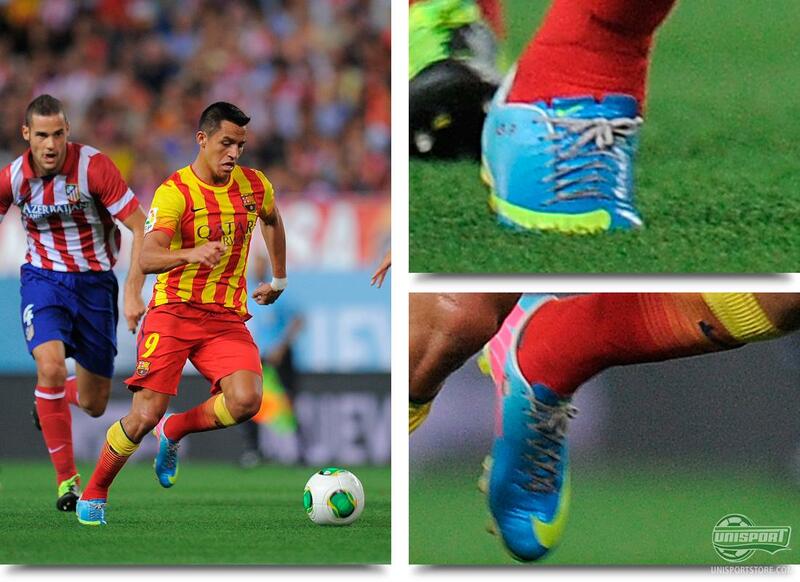 In any case the colourful winger, looks to be quite a fan of variation on his feet. 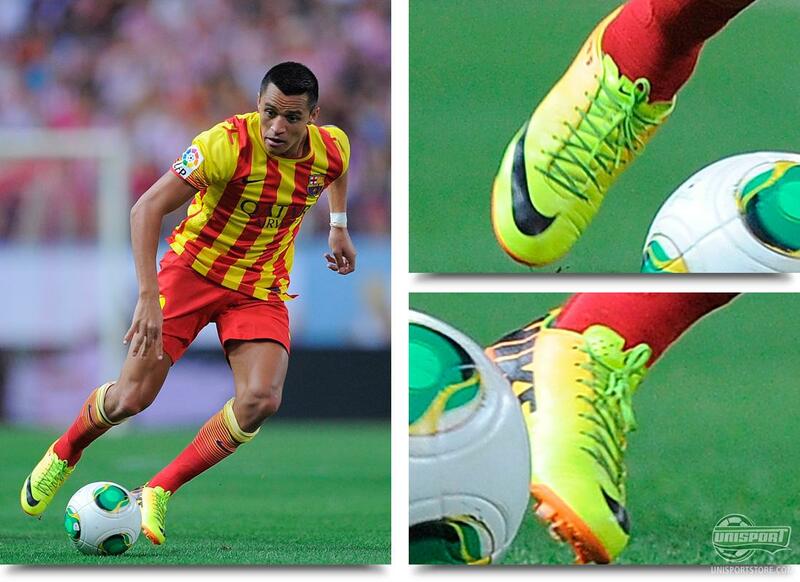 In Barcelona's Super Cup-game against Atletico Madrid, Alexis Sanchez started the game wearing a pair of Volt/Black-Bright Citrus Nike Mercurial Vapor IX. They suited the Barcelona away kit very nicely, but that was apparently not enough for the pacey forward with exquisite dribbling ability, who changed boot at half time. In the half time interval he switched to the Neptune Blue/Volt-Tide Pool Pool Blue. Jonas Gutierrez (Newcastle)  Warrior Sports Skreamer S-lite Blue/White/Red There are also plenty of colours on show, when Jonas Gutierrez takes to the field. 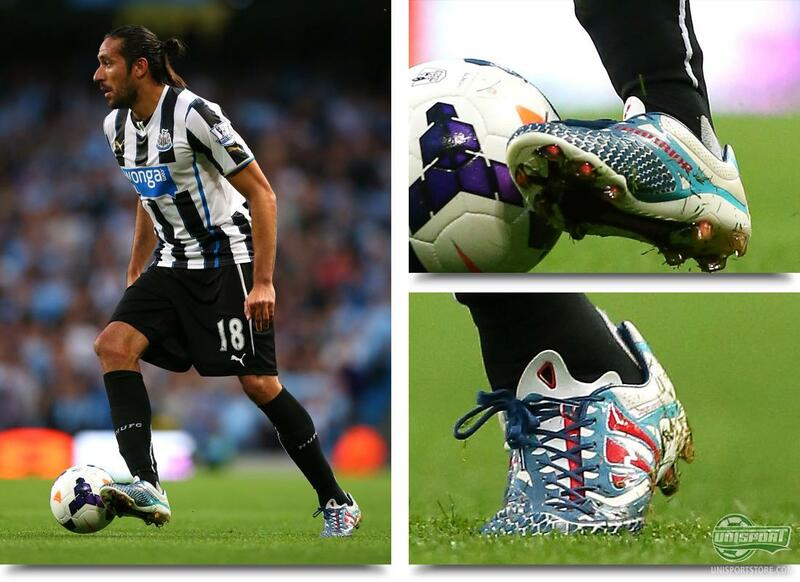 The Energetic midfielder this wore a pair of Warrior Sports Skreamer S-lite at last Mondays game against Manchester City. The boot is made from a thin synthetic upper, but Gutierrez still has a great grip on the ball, all thanks to the small fins, which Warrior sports have fitted on the explosive and colouful boot. 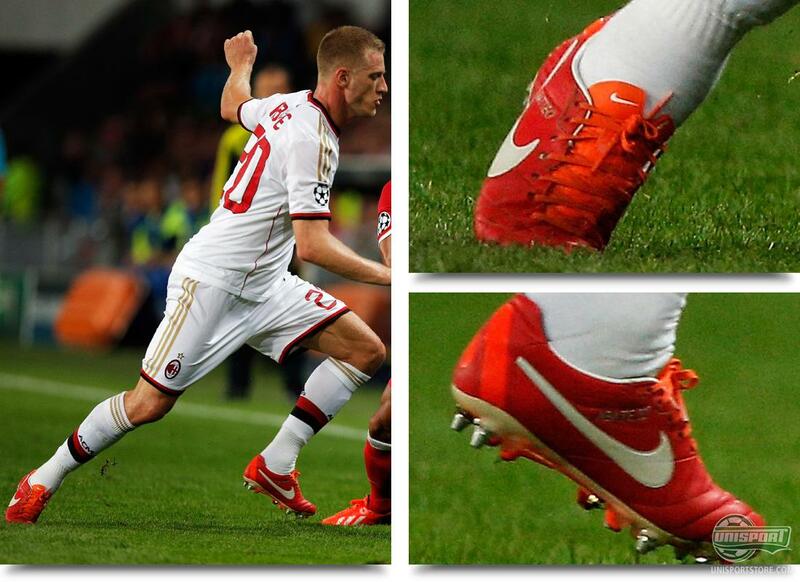 Ignazio Abate (AC Milan)  Nike Tiempo Legend IV Sunburst/White-Total Crimson Colours are important and especially if you play for AC Milan. The clubs red colours are ones the fans are very proud of and it is therefore no surprise to us that his Nike Tiempo Legend IV are too. Pride is a big part of Abate's play and another thing he looks to be proud of is his son, whose name he has embroidered on his boot. Ignazio and the rest of the Milan boys have also gotten a good offset in their bid for Champions League football, as they drew 1-1 away from home. 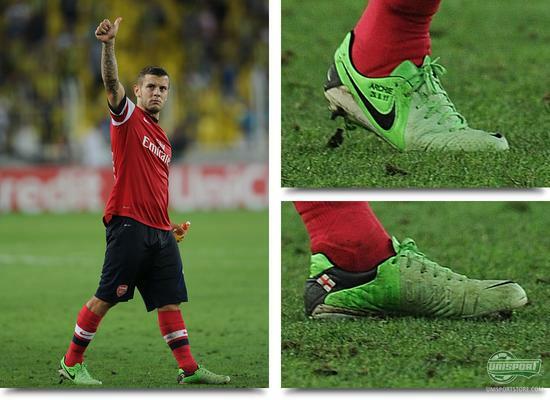 Jack Wilshere (Arsenal)  Nike CTR360 Maestri III Fresh Mint/Black-Neo Lime It started as a rarity, but now its turning into the norm for Arsenals midfield dynamo Jack Wilshere. He used to prefer his Current Blue/Black-Volt, but in the last couple of games he has been wearing the control boot boot in its slightly older Fresh Mint/Black-Neo Lime colourway. Things went a little better yesterday, compared to last weekend, with The Gunners regaining some lost honour after their mutilation at the hands of Aston Villa. 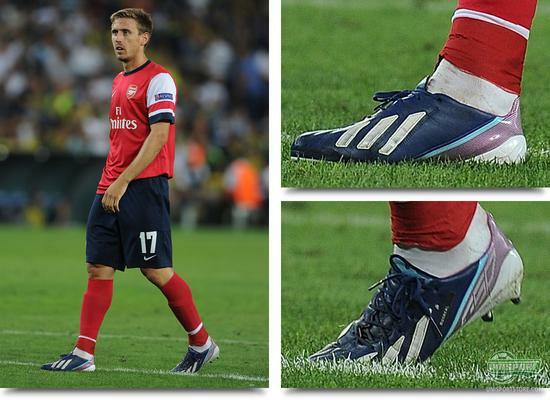 Nacho Monreal (Arsenal)  Adidas F50 Adizero Blue/Purple/White Plenty of colours at the feet of Arsenals left back Nacho Monreal, who Arsene Wenger bought from Malaga last season. He will be fighting for a spot in the starting line-up with Kieran Gibbs, who unfortunately for the Spaniard scored the first goal. 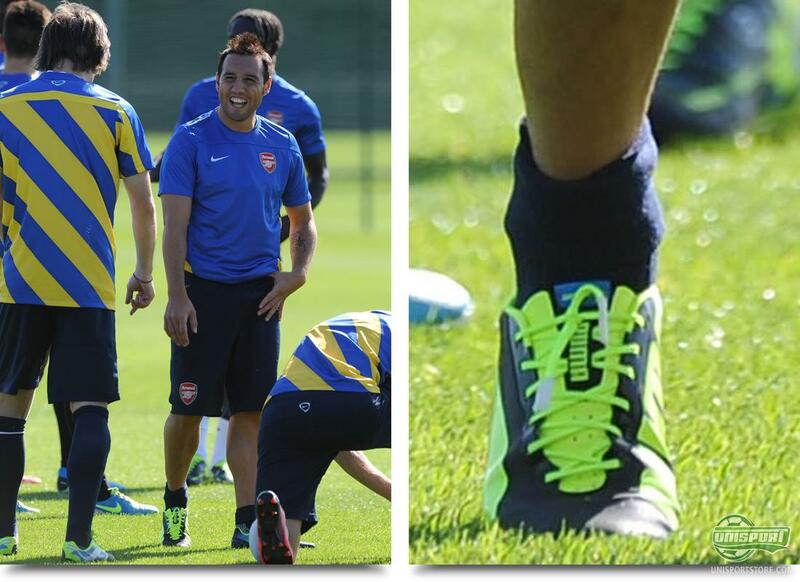 Nacho and his Adidas F50 Adizero were substituted on in the end, when they replaced Theo Walcott. 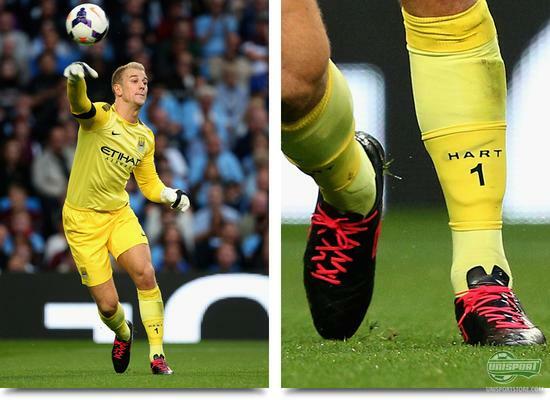 Joe Hart (Manchester City)  Umbro Speciali 4 Black/Larva The English national team keeper Joe Hart has had no trouble keeping his spot as first choice keeper at City. He is always sure to give you a solid performance and this Monday he and his elegant Umbro Speciali 4, could stand and watch for the most of the game, as Newcastle were pegged back and eventually swept aside by City's daunting front men. 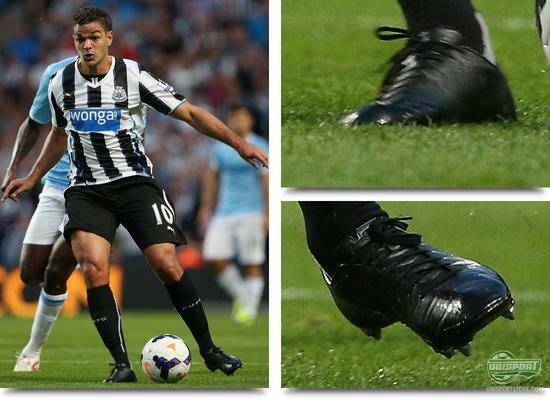 Hatem Ben Arfa (Newcastle)  Nike Mercurial Blackout It never easy to see what boot the stars are wearing when they blackout their boots. We have had a look at the boots that Hatem Ben Arfa wore this Monday. The shape of the boot looks a lot like the two newest Mercurial boots, but we have formerly seen him wearing a blackout Superfly boot and we can't help but notice, what looks like Flywire on the medial side of the foot. It could defintiely be a blackouted Nike Mercurial Superfly III, but with a Vapor VIII soleplate. We aren't sure, but what do you think it looks like? Santi Carzola (Arsenal) - Puma Evospeed 1.2 Black/Neon It is now time to wrap up this round of boot spots and we do so with Arsenals Spanish midfield magician, Santi Carzola. Last week we saw him training in a pair of Puma Evospeed 1.2, but then in the weekends game he wore his Adidas Adipure 11Pro. He pulled the same stunt when Arsenal faced Fenerbache, training in the Evospeed 1.2 and playing with the Adipure 11Pro. Whether things will escalate and Carzola will end up a Puma man, who knows, but you will definitely be the first to find out here on Unisportstore. That was all for this round of boot spots, which gave us a centreback in Hypervenom and plenty of colours from around Europe. The season is finally up and running again, so that means boot spots are going at full throttle again. What did you think of this round of spots? Have you seen something we missed? We would love to hear from you in the comment-section down below, as well as on Facebook and Twitter.